When it came out last week that an environmental scientist from Marshall University had found abnormal levels of Formaldehyde in a local water sample, I pretty much lost it. I suppose if I had received this news in a vacuum I would have responded with shock and restraint, but as the latest in a staggeringly long string of information leaks regarding the massive chemical spill along the Elk River in Charleston, it was just too much. For weeks after the news broke that the water supply for over 300,000 West Virginians had been poisoned by thousands of gallons of a chemical we knew next to nothing about, I kept expecting to hear this shrill yawp of outrage from the news media and the American people, demanding that Freedom Industries be taken to task for the destruction they had wrought. I thought that I’d see Brian Williams and Diane Sawyer feeding the nation updates every night about it like they do with wildfires and droughts in California or floods in Colorado. That did not turn out to be the case. My spirits were buoyed by the tireless work of volunteers on the ground in West Virginia and the willingness of my friends and family to donate money once the crisis had been brought to their attention, but I was still waiting to see the frustration and anger that the spill had generated in me and millions of other people reflected in the words and actions of someone who had the means to affect immediate and meaningful change. I finally saw that fire today in the form of Senator Jay Rockefeller (D-WV). 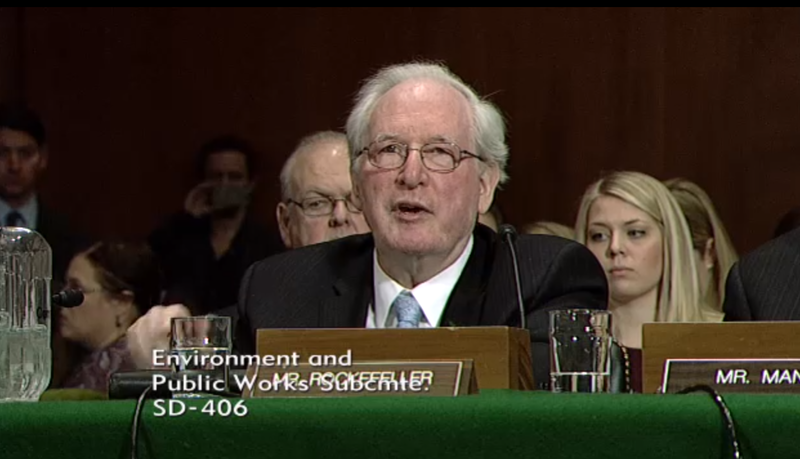 During his testimony earlier today before the Senate Committee on Environment and Public Works’ Water and Wildlife Subcommittee, Senator Rockefeller had a very palpable edge to him. Some of his remarks were scripted, but there were a number of times during his testimony where you could almost see Rockefeller’s dissatisfaction and rancor forcing words out of his mouth that he hadn’t planned on saying. Early on in his remarks, Rockefeller relayed to his colleagues in the Senate that a good number of people with whom he had spoken had voiced reservations about continuing to live West Virginia, telling the committee that these people, “have no confidence in the future. They have no confidence in our regulatory scheme—either at the state or federal level—and they’re not taking any chances because they don’t know what that water’s going to be like in the future, and neither do I.” In the agitated timbre of his voice, you could tell that Rockefeller’s concern for the people of his adopted home state was genuine—that he was going to bat for them more out of conviction than obligation. The same cannot be said about Joe Manchin, the junior Senator from West Virginia, who spoke to the Water and Wildlife Subcommittee with the same amount of passion that you or I might exude while reading aloud the ingredients in a bottle of ketchup. Close to half of Manchin’s brief testimony consisted of him thanking various members of the Senate, along with folks from a few other federal and state agencies, for doing unspecified work to help prepare the bills that he would spend the other half of his testimony talking about. The first bill, the Chemical Safety and Drinking Water Protection Act, is a benign, halfway-decent bit of legislation that essentially ensures that chemical storage facilities near sources of drinking water be inspected more often, while making sure that above ground chemical storage facilities are inspected at all. The second bill, The Chemical Safety Improve Act, (which I covered extensively in an earlier article) aims to regulate chemicals by dividing them up into two groups—high priority and low priority—and subjecting high priority chemicals to safety assessments and determinations while not acknowledging the low priority chemicals. Ironically enough, MCHM would likely be classified as a low priority chemical, meaning that Senator Manchin’s legislative answer to the Elk River spill wouldn’t even cover the very substance that has been poisoning his constituents. On the other hand, the only piece of legislation being plugged by Senator Rockefeller was a bill he had written with Senator Brian Schatz (D-HI) that would require companies to clean up and “pay every single nickel” of any spill of a “non-hazardous” chemical or substance that they cause. However, Rockefeller was quick to contemptuously point out that the bill likely wouldn’t pass in this Congress before going on a truly awesome old man rant, going off script and saying, “I happen to be something called a Democrat. I believe in spending money on infrastructure” before telling those assembled essentially that back in his day, Congress actually believed in getting things done. Go back and read that Rockefeller quote again. Then go ahead and click on the link to watch him speak it (around 46:45 mark). Do you hear that? That’s anger…and it’s one of the few things I’ve heard in weeks that gives me hope.